I'm still on that tape kick. I have a deep love for anything self-adhesive; peeling and sticking are two of my all-time favorite activities. So I tried an experiment with painter's tape to make a pattern on fabric. You'll need: fabric, a measuring tape or yardstick, scissors, masking or painter's tape, fabric paint (I like Jacquard Textile Color), a foam brush, a protective surface of some kind, and any sewing supplies you'll need to turn the painted fabric into something. I decided to make simple envelope pillow cover. 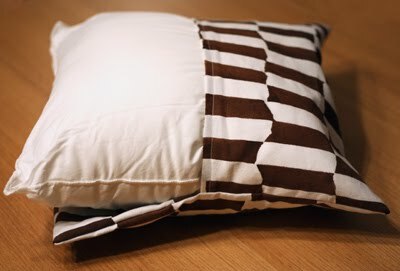 It's the easiest home decor sewing project there is—four straight seams and you're done. For pillow cover instructions, see here. To prepare your fabric, cut out a piece a few inches larger than the total amount you'll need for your project. 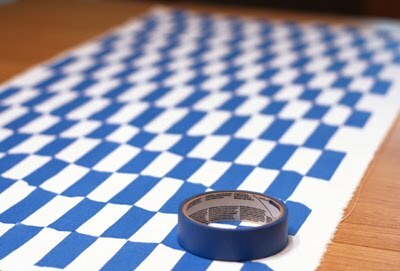 With painter's tape, make a pattern on your fabric. I thought the torn edges of the tape were interesting, but you could cut your tape if you like things straight. I varied the width of the tape pieces for a little variety. Place the taped-up fabric on a plastic tablecloth or other protective surface. 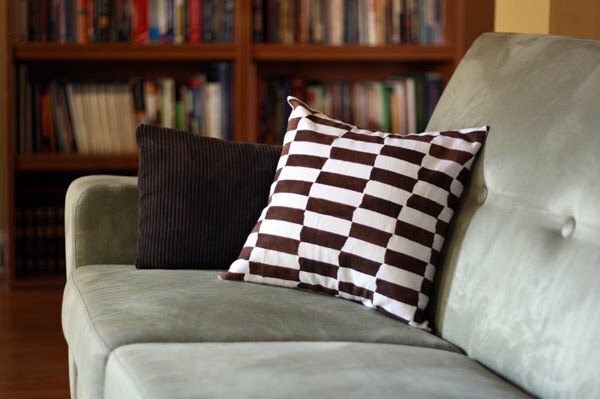 Some paint might seep through to the back side of the fabric and you probably don't want a checkerboard on your dining room table. You might even tape the fabric to the plastic to keep it from sliding around. Then dab on the fabric paint with a foam brush, filling each tapeless area. Let the fabric dry, then pull off the tape pieces. Set the paint by following the manufacturer's instructions; usually ironing it will do it. Then sew the fabric into something nice. WOW! Cute idea! It would be much faster than freezer paper for simple designs! I absolutely LOVE this idea. And so well done. The brown/white is so chic, too. Great share! Looks like you've been having fun lately! Very cute! Courtney likes it, too. FUN! I'm adding this to the list of 10 million other things I want to make. VERY COOL! WOAH!!! Awesome, love it...I think I might even do this on a t-shirt! I'm constantly painting designs on tshirts with acrylic paint! What a great project! My mind is already spinning to think of all the other designs I could make with this technique. Thanks for sharing! Brilliant. I LOVE this idea. Thanks! ...but if only i knew how to sew. so awesome! your blog rocks. I LOVE that fabric. It looks really great! oh that is so cool. love the edges the tape leaves and the variation is great! You are a genius! I love the organic feel the torn tape left. This is such a neat idea. I love it! Very cool idea! So simple and yet incredibly versitile. It looks like it might be a little time consuming, but totally worth it! I really like how you left the edges of the tape rough, it really adds to the pattern. i so cannot get out the blue tape right now, but you make me want to. That is awesome! What a great and easy DIY. Thanks for sharing! I'm a big fan of the rough edges on the tape. Maybe it appeals to my messy and lazy nature, haha. But seriously, it looks awesome! Love this! Something to put on my to do list. Thanks. I love this! 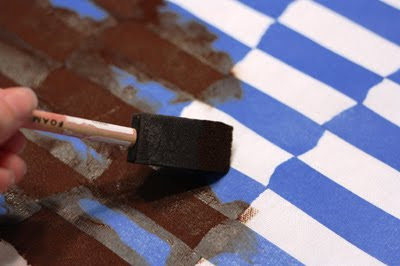 My daughter and I made a tee shirt using this method, except sprayed on the paint for a splattered look. Turned out very cute! This is fantastic! Love it. Thanks for the inspiration! come ON! That is so easy and cool! thanks for sharing. That's so clever and I love the imperfection of the shapes/edges. Really well done! I love the effect of the torn tape edges. Great job! Someday I will have to try this. Okay, this is why I love your blog. This is adorable. Lovely design. You know, that's really pretty super cool. Love the pattern the torn ends of the tape makes, too. This is stunning! And I agree, the torn edges are really interesting. Thanks for the great diy! Great idea, thanks for that!! Thanks for the link to my tute...you're the best! Oh, I love this and it's funny you posted this because lately I've been inspired to make art from tape/office supplies - so cool! This would be really neat on one of those canvas tote bags too - then you wouldn't need to sew - hmm... I'm thinking girl's birthday party activity. Oooh! I love this. I've got a few pillows to recover and this may just be the ticket for one of them. Thanks for sharing! That looks very nice and so simple to make! Thanks for sharing. Tres belle idée, encore !! I can do this! Yes! I say! Best ideas are simple and stylish - and cost next to nothing! looks like a weekend project is in the works! thanks for the idea! Two words - WAY COOL! That printing idea is really, really excellent. Might try it....one day, far in the future when I get everything else done. *sigh*. Such a great idea! Love how it turned out! This is really nice, I have to try this with all kinds of colors! Thank you!!! How cool is this??!! I have to try this out! Thank you for a great tip! How fun is this and I love your black and white graphic print. I think even I could pull this one off. Thanks for sharing. i DIE over this!!!!! i am SO trying this one! Wanted you to know I posted a link to this toturial today on my blog, PaperFriendly. this idea makes me SOOO happy! thanks for sharing.. i'm going to look for something to tape! this is really cool DIY... loving it! Ooh! Looooove this! And I adore your blog in general, U R a crafty one and an artist, and you are great at featuring both of those. Love this so original and turned out brilliantly! Thanks, I bet my little girls would love to do a more free-form version of this! looks like a designer store-bought pillow very smart and do-able! Ahhh yes...this is in my queue of springtime projects to do. I want to try it with a chevron pattern! I think that would be fabulous. Just found your site by a recommendation from another site I follow:) One of your commenters(if that is a word) suggested doing a T-shirt. I think that is a great idea. I wouldn't have to sew anything and sadly that is more my speed. Anyway I love the idea of tearing the tape with uneven edges, just really adds something to the print! Your site is very pretty, glad I found it!! So sweet! Super thanks! I was looking for something to do on this dreary Saturday. I'm going to try this and then use your other tutorial about how to make fabric wall art. I'm so excited!! I'll post pictures on my blog, isaidthankyou.wordpress.com. Can't wait! Never knew that a tape could make a huge difference on a simple fabric. this is so cool. 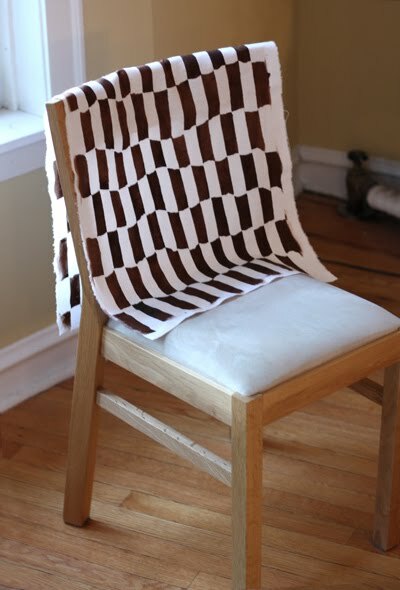 Love the idea of creating a great design on a fabric. Simply beautiful! Gotta love tape!!!! this works nice on anything plastic as well. tin containers too! love it!! !beautiful work!!!! I tried it! Thank you o much for this great idea. See the result on my blog!